Home Expert Advice Skincare Advice Basic Skin Care Tips What Is Microneedling? The answer is yes, to some extent. However, despite hundreds of published studies and articles about microneedling, it isn’t easy getting to the truth about what it can and can’t do. That’s because much of the information is often skewed by either poorly controlled studies or is done by people selling the devices or procedures, meaning there’s built-in motivation for favorable outcomes. Here’s the basics of what you need to know to make an educated decision about whether microneedling is for you. Microneedling, especially when done in a medical setting, is recognized by the research for improving many different types of acne scarring. However, the before and after photographs you’re shown are always the ones that are the most impressive, you’ll rarely see pictures of the people who only had less than stellar results. Just know that not everyone will get the “best” results. 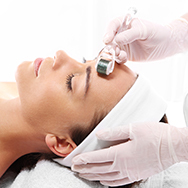 The claims touting microneedling for wrinkles, skin discolorations, and pore size have research that’s somewhat less clear. Some studies show worthwhile results but others not so much and again there is the issue of the reliability of the research because it comes from the companies promoting the device or service. However, in theory, at least when it comes to wrinkles, it should work because of the way it builds support in the lower layers of skin. The other claims should be viewed with skepticism. The secondary but still important issue is that skincare ingredients like antioxidants, sunscreen actives, hyaluronic acid, ceramides, and skin-replenishing ingredients in general must stay in the top layers of skin to have benefit. Environmental free-radical damage hits skin’s surface layers first, so if there’s nothing there to help these troublemakers simply keep going, stopping them sooner is better for skin. Some ingredients, such as retinol, could benefit from deeper absorption, but that's not always a good thing because when skin is compromised that direct absorption can cause a sensitizing reaction. An enhanced slow-release delivery system in the retinol products you buy is so much better for skin. Dermastamps resemble Dermapens but have a larger head with more needles protruding from it for use on larger areas. Dermastamps may be motorized or manual, and work exactly as the name implies: Rather than rolling needles over the skin the needles are systematically stamped into skin. Another important factor to consider is that at-home devices are not as of yet regulated by the FDA. This means there are no regulations establishing legitimate guidelines for what these devices can actually do (or even claim they can do) and what their risks may be. The FDA is working on it but in the meantime it’s a jungle of claims and no oversight.